Thurs. Dec 17th 8pm TICKETS Update: Astronaut John Grunsfeld to join this event! This year, AGU (American Geophysical Union), the International Geosphere Biosphere Programme (IGBP) and Future Earth are co-hosting a performance of Bella Gaia on Thursday, Dec 17, at 8:00 P.M., in conjunction with IGBP’s anniversary celebration and this year’s International Fall Meeting. 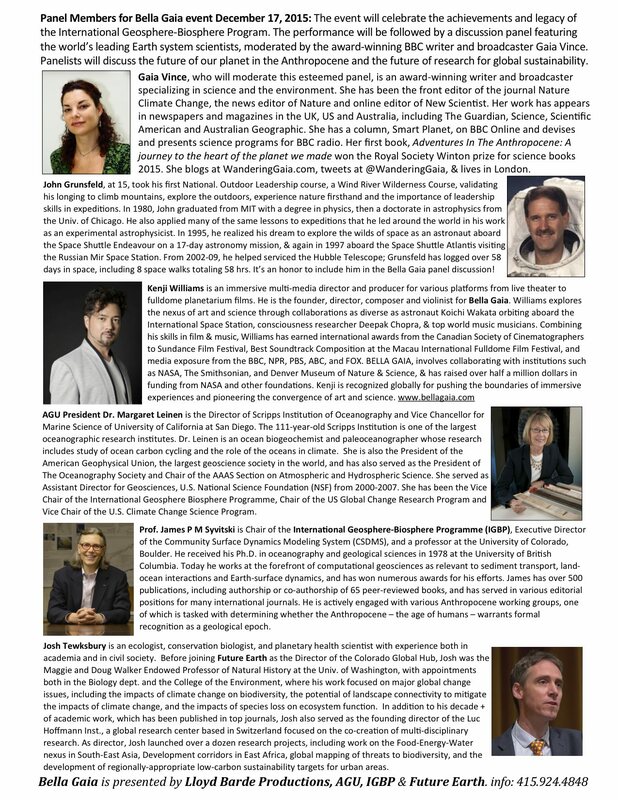 Also, an informative and engaging panel discussion will be held after the performance, featuring Kenji Williams, director-composer of Bella Gaia, astronaut John Grunsfeld (who fixed the Hubble Telescope) and other panelists. See speaker lineup here. Join us at the Herbst Theatre, San Francisco War Memorial and Performing Arts Center for this Gala Scientific gathering!